Twice this week I’ve answered questions about capturing online videos for research purposes. Scholars who are doing research based on clips of historical commercials are worried that their source materials may become unavailable and that their research will be more difficult to complete or share if this happens. This is the step-by-step how-to that will allow you to capture video from sources like Youtube, GoogleVideo, YahooVideo, and other online video hosts for educational purposes. These instructions are for users on the Windows operating system. Before you start it will simplify things if you create a project folder somewhere on your computer where you will store the videos you capture. For example, right click on the desktop and create a new folder. Call it something meaningful like youtubeVideos. There are 3 stages to the entire process: downloading, converting, and burning a disc. Start the new application by double clicking the new icon that should have just appeared on your desktop. Select Download video from Youtube and then click Ok. Locate the file that you just downloaded. It will either be on your desktop or in your default save folder. Drag and drop it into the folder you created for this project. Select the file to be converted. Check “Convert video previously downloaded.” Click on Ok. When it’s done processing a .mov file should now be in the folder. Open your burning software (Nero/NTI/etc). Select create new data disc. Browse to your project folder. Select the .mov files you’d like to burn. Are you suffering Facebook Frustration because no one comments on your status updates? Just like blogging, a good way to attract visitors to your site is to interact with the community by commenting on other people’s sites. The more you comment elsewhere the more chance others will see your name and stop by to visit on your page. Make sense? I know there are a few digiKam users reading this blog. (Rob, this post is for you.) There’s no excuse now for not putting more photos up on your flickr accounts! Look under File > Export > Export to Flickr in the digiKam main window. It’s easy-peasy to upload a single photo or photos in a batch. Here’s a picture I uploaded via the digiKam flickr plugin. It was taken last Saturday night at the Moon in June race in Windsor, Ontario. 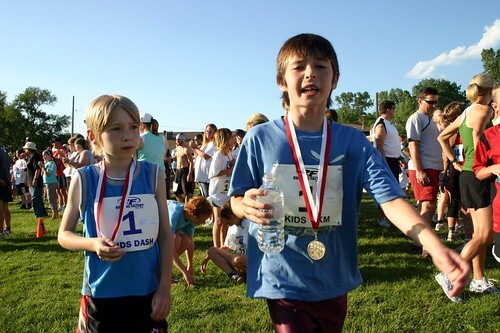 The boy on the left was 1st place boy in the 200m dash and the one on the right was first in his age group in the 1km race. w00t! A group of Adsense publishers received emails yesterday requiring that they log into the Adsense panel and accept the new terms and conditions (or else!). Turns out it wasn’t a phishing attack and there are no new terms. The message was sent by mistake to users that have already accepted. Google is sorry. The terms were last updated in February so if you accepted them then you’re a-okay to keep publishing. The latest update: We’ve found that a number of emails were sent incorrectly to publishers who had already accepted the updated Terms and Conditions in the past…To clarify, the most recent update to the Terms and Conditions occurred at the end of February, and there haven’t been any changes since. If you already accepted the Terms and Conditions after they were updated in February, you won’t need to re-accept them, and you won’t be prompted to do so when you log in. Our team will be following up in the next few days via email with those publishers who received a reminder in error. I apologize for the scare today — thanks for letting our team know about this issue. It’s all about negotiation. When I was young /*sigh — was that only last year? */ I had plenty of time for playing PS2 or World of Warcraft with Rob. Life seems busier now with grad school and a bigger house (and bigger kids) to take care of. We played some WoW over the xmas break (when I was debating dropping out of school) but I stayed enrolled and had to give up the WoW again. Or so I thought. He must have heard me stressing about housework because all it took for him to get me on board for a weekly 2-hour WoW date was his offer to clean the bathroom on Saturday. So for the past month, we alternate who cleans upstairs and who cleans down —– plus vacuuming the stairs every other week. Now every Tuesday night we head to a coffee shop with free wifi and get busy questing on Deathwing. Last week we each got a level, this week I did. Next week it will be his turn again. Part of the deal is that we show up ready to play. Any training or playing barbies (looking for gear on the Auction House and/or running to the bank for new clothes) has to be done ahead of time. I’m surprised by how much I look forward to it — and love that the bathroom is clean and shiny all the time.